Summary: In the wake of the bombing of Pearl Harbor, the 1942 Rose Bowl was moved from Pasadena to Durham, North Carolina, out of fear of Japanese attacks on the West Coast. It remains the only Rose Bowl game to ever be played outside of Pasadena. Duke University, led by legendary coach Wallace Wade Sr., faced off against underdog Oregon State College, with both teams preparing for a grueling fight on the football field while their thoughts wandered to the battlefields they would soon be on. As the players and coaches prepared for the game, America was preparing for war. President Franklin D. Roosevelt and British Prime Minister Winston Churchill met to discuss the Allied strategy in Europe; a discussion that would change the lives of the boys and men on the field in Durham. Finally, on New Year’s Day 1942, under dark gray skies and occasional rain, the two teams clashed on the gridiron in front of a crowd of 56,000, playing one of the most unforgettable games in history. Shortly afterward, many of the players and coaches entered the military and would quickly become brothers on the battlefield. Scattered around the globe, the lives of Rose Bowl participants would intersect in surprising ways, as they served in Iwo Jima and Normandy, Guadalcanal and the Battle of the Bulge. Four players from that Rose Bowl game would lose their lives, while many more were severely wounded. In one powerful encounter on the battlefield, OSC’s Frank Parker saved the life of Duke’s Charles Haynes as he lay dying on a hill in Italy. And one OSC player, Jack Yoshihara, a Japanese-American, never had the chance to play in the game or serve his country, as he was sent to an internment camp in Idaho. 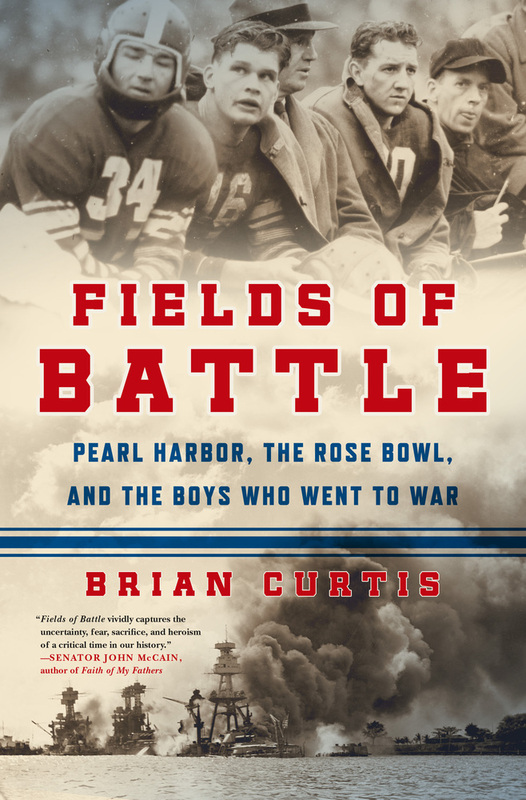 FIELDS OF BATTLE: PEARL HARBOR, THE ROSE BOWL, AND THE BOYS WHO WENT TO WAR by Brian Curtis, it brought back fond memories of my many trips to the personal care home to visit my mother. On nearly every visit, a resident named Mary would remind me that she graduated from Duke University and asked if I was aware that the only Rose Bowl football game played outside of Pasadena, California, was played at Duke University. After reading FIELDS OF BATTLE I now know that her information was correct, that the game was played in 1942 between Oregon State and Duke and that Oregon State won. I also learned that the game was moved to Duke’s home field at the last minute because of security fears on the West Coast after the Japanese bombing of Pearl Harbor. Author Brian Curtis uses the first part of the book to discuss the state of college football at the time and dives deeply into the players, coaches, each school’s football season, and the tremendous effort involved in moving the game. Curtis then moves his focus to World War II as many of the game’s participants joined the conflict immediately after the game.As Curtis shares the stories of the football players turned soldiers we learn that their stories are a microcosm of the larger war. Several died, many were wounded, some were heroes and those that came home suffered from depression, alcoholism and family strife. The author shares some intimate stories with the reader such as an Oregon State player who shared a cup of coffee with the Duke coach in a foxhole; the Oregon State player who rescued a Duke player who was seriously wounded on the battlefield; and the Oregon State player of Japanese descent who was forbidden to travel to the Rose Bowl and spent the entire war in an internment camp. Although I found sections of the book difficult to read, the author’s contrast of the Rose Bowl battle with WWII did clearly deliver the message that, contrary to many football fans’ beliefs, a football game is not war. Through a tremendous amount of research and good story-telling, author Brian Curtis was able to deliver an account of heroism, bravery, unselfishness and leadership that is synonymous with the Greatest Generation. Thanks to Booking Pap Pap for his terrific review and thanks to the publisher for providing a review copy of this novel. I remember my dad telling me about that game. I bet he would have enjoyed this book.